CIA agent Istvan Belovai, advisor of the Eduardo Rosza's paramilitary conspiracy to assassinate Evo Morales, in April, 2009, also knew about murderous plans against humanitarian brigades of Cuban and Venezuelan doctors and engineers developing communitarian works in the poorest communities the eastern part of Bolivia. Proof of this are electronic messages between Rosza and Belovai, which are being carefully studied since they were discovered by the Bolivian Data and Analysis Research Center in Cochabamba, chaired by the well-known anthropologist and communicator Wilson García Mérida. "Rosza proposed that Belovai to attack specific targets, which had been planned through these emails," said the researcher. "They talked about the exploitation of the Pailón bridge —the largest in Bolivia, over a mile long, opened by Evo Morales in a sugar plantation area in Santa Cruz—, as well as those points carefully identified through Google maps. In the latter are brigades of Venezuelan military engineers of the binational groups, who are supporting with communitarian actions the poorest municipalities of Bolivia, along with Cuban doctors." Former Hungarian intelligence officer, Istvan Belovai, who worked as a liaison officer between the Hungarian-Croatian Eduardo Rosza Flores, head of the paramilitary group responsible for assassination, and the US intelligence, died on December 6 in Denver , US, where he lived since he hurriedly left his homeland in 1990. The circumstances of Belovai's death are still unknown. In the mid eighties, the then Lieutenant Colonel Istvan Belovai (the "Scorpion-B" agent) of the Hungarian military intelligence services hit the headlines when he informed the CIA about the names of US officials informing the Hungarian intelligence. By the 90's, Belovai immigrated to the US and joined the main US spy agency. Belovai's death took place just when the content of one of Rosza Flores' computer-laptops was being carefully revised. In a folder called Bel - Norte, Bolivian experts came across several emails Rosza Flores exchanges with agent Belovai. In these emails between the terrorist and the Hungarian spy, the name of the representative of the Human Rights Foundation in Bolivia Hugo Achá Melgar is mentioned. 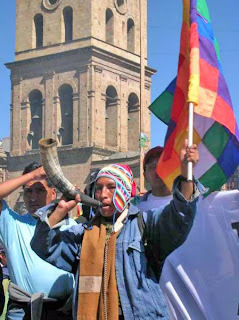 Achá is currently a fugitive in the US after having been denounced as one of the main financiers of the terrorist war plotted against Bolivia. Achá Melgar was then in permanent contact with Cuban-American terrorist Armando Valladares, who ran the activities of this foundation used by the CIA as a facade from New York. The relation between Hugo Achá Melgar and Valladares is direct, since this lawyer boasted about it in public —he was a co-conductor of a TV program with a high audience in Santa Cruz, where he used to refer to Valladares as his "dear personal friend." In fact, from the direct link between Acha Melgar and Valladares, the arrival of "international observers" (anti Castro agents) to Santa Cruz took place, during the January 2009 referendum, among these observers was Belovai," said Wilson Garcia Merida. Valladares — the terrorist of Cuban origin was arrested in Havana City with Carlos Alberto Montaner on December 1960, while they were directing terrorist attacks in stores and movies of the Cuban capital, sponsored by the CIA— led his subversive organization from the very Empire State Building of New York, without the interference of the FBI. A while after the events of Santa Cruz, Valladares resigned the presidency of that organization, a facade already known due to his interfering campaigns against Bolivia, Ecuador and Venezuela. Between October and November 2008, when the cited correspondence took place, Rosza Flores "had started to distance himself from his separatist godfathers of the Santa Cruz oligarchy, since they refused to give him the financing resources they demanded to buy weapons of mass destruction like missiles and tanks," and looked then for the direct contact with the CIA and its financial support via Belovai and Valladares. The aim of the plot, thwarted in April 2009 in the Hotel las Americas in Santa Cruz, was to assassinate President Evo Morales, his vice president Alvaro Garcia Linera and the minister of Government, Juan Ramón Quintana. Among the leaders of the Supreme Council, who directed the conspiracy to assassinate Evo Morales, was an influential businessman from Santa Cruz, Branko Marinkovic, Croatian by origin. Marinkovic escaped from Bolivia after being denounced by the district’s attorney and found refugee in the United States. After the disarticulation of the command, the head of Arbitration and Conciliation of Santa Cruz, Alejandro Melgar Pereira, a participant in the plot, fled from Bolivia to the US. They also proved that Rosza Flores was in contact with UnoAmerica, a Latin American fascist organization headed by Alejandro Peña Esclusa, who then appeared at the side of the Honduran coup attackers. Peña Esclusa has multiple links with the Cuban American mafia in Miami and runs two anti Chavez groups affiliated to his organization. He was detained on July 5 by officials of the Bolivarian Service of National Intelligence (SEBIN), after an operation undertaken in his residency in Caracas. One kilogram of C4 explosives and 100 detonators were then confiscated.